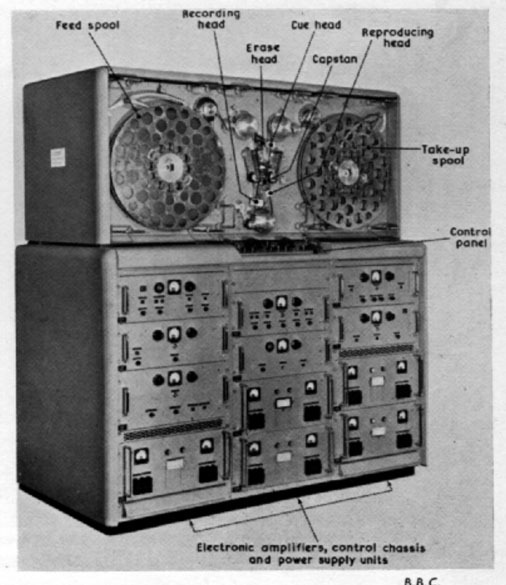 VERA (Vision Electronic Recording Apparatus) was a BBC developed video tape recorder, which began design in 1952 and continued in development until 1958 when, although serviceable to a moderate standard of picture, it was inevitably overtaken by the success of the Ampex Quadruplex format. It gave pictures roughly comparable with film recordings, but was extremely unwieldy to operate. The reels were 20" across and the tape ran at a speed of 200" per second past a fixed head assembly. These reels of ½" tape would, in spite of their size and length, only provide for 15 minutes of recording.